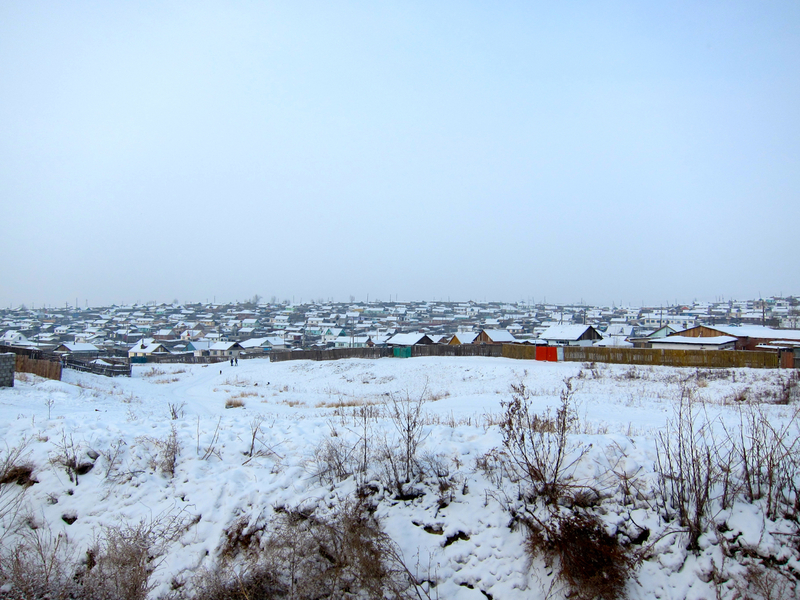 I visited Darkhan as part of my work with Kiva.org, the crowdfunding microfinance non-profit. Kiva partners with two local microfinance organisations—XacBank and Credit Mongol. Part of my job is to undertake an audit of a random sample of Borrowers each organisation has funded through Kiva, to ensure the partnership is operating within agreed parameters. The drive to Darkhan, once again, gave me a first-hand appreciation of the size and harshness of Mongolia’s countryside. Farms or other signs of human settlement were few and far between. Instead, the view for the majority of the trip consisted of stark, snow-covered hills from horizon to horizon. We left the smoke haze of Ulaanbaatar behind and, for a time, the air was beautifully clear, giving an unobstructed view of the landscape for kilometres around. But within the first hour, the sky greyed, and the viewing distance shortened dramatically as we drove into a cloud of snowfall that persisted for the rest of the journey and our entire stay in Darkhan. 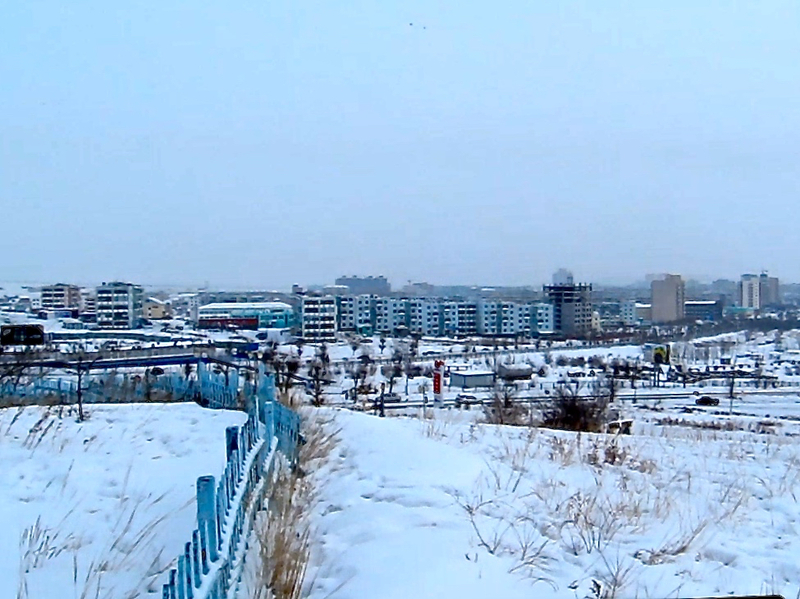 Darkhan’s winters are colder, and it receives much higher snowfall than Ulaanbaatar. There are two sides to Darkhan: The Soviet-built central area of high rises is referred to by locals as “new Darkhan”, whilst the district of small houses and ger tents is referred to as “old Darkhan”. The neighbourhoods of houses and gers in Old Darkhan are significantly different from the ger districts of Ulaanbaatar. Old Darkhan seems far more organised and established than the ramshackle neighbourhoods that have sprung up around Ulaanbaatar in recent years. The average building quality in Darkhan seems significantly higher, and there are far more houses than ger tents. But the region is still poor, making it an ideal area for Kiva and Credit Mongol to assist. The Borrower we visited in Darkhan is a perfect example of the kind of family whose lives microfinance can help improve. Daariimaa is a 55-year-old horse and cattle farmer. She took out a loan with Kiva and Credit Mongol during 2014 to finance home renovations, in particular to improve insulation. 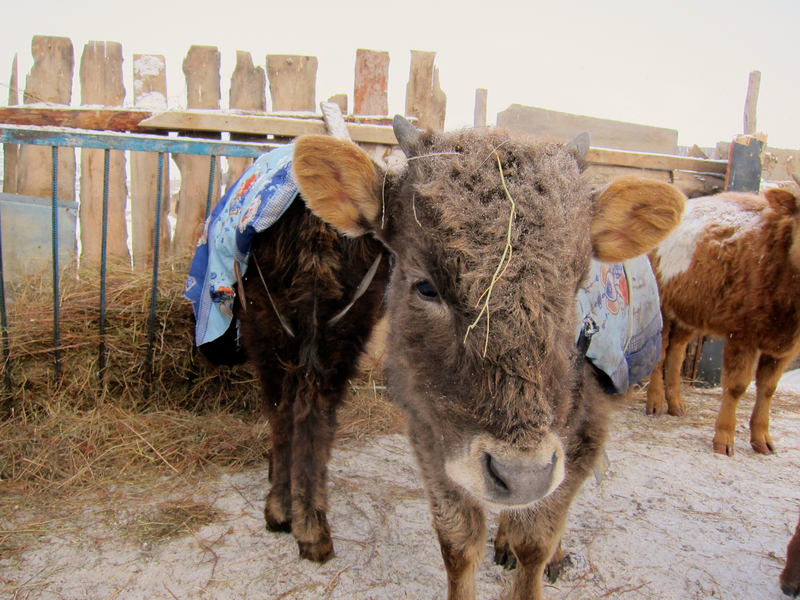 In Mongolia, improving home insulation has greater importance than simply improving comfort. The poorest families in Mongolia can spend up to 40% of their monthly budget on heating during Winter, due to the biting cold, inefficient coal-fired stoves, and poor insulation. Replacing stoves and improving household insulation has a long-term benefit on the family budget, by significantly reducing ongoing heating expenses. 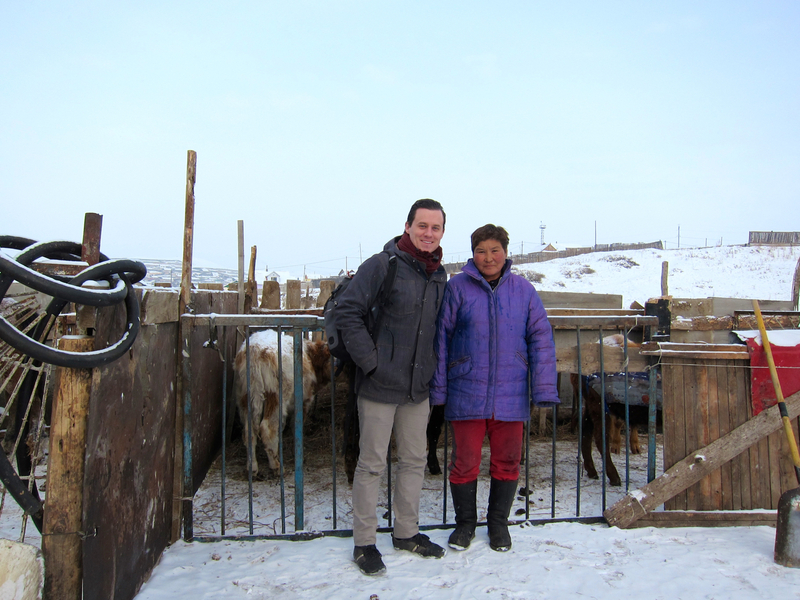 Daaariimaa and her husband have been rearing livestock in Darkhan for over 30 years. They live alone, although their adult children live close by with their own families. When we arrived, we were immediately greeted by the family guard dog. When I say “dog”, what I really mean is bear-wolf hybrid. He was the most enormous and intimidating dog I’ve ever seen. 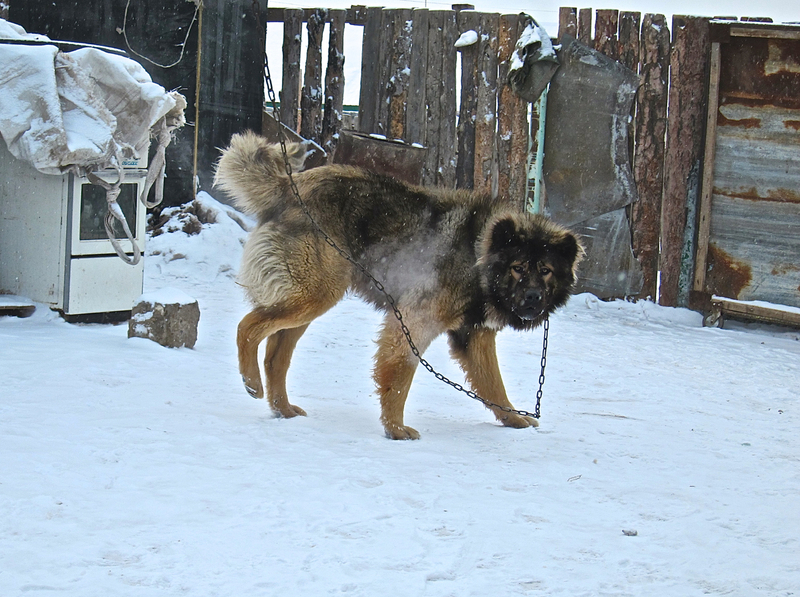 I don’t know his exact breed mix, but he appeared to have at least some Mongolian Bankhar in him. 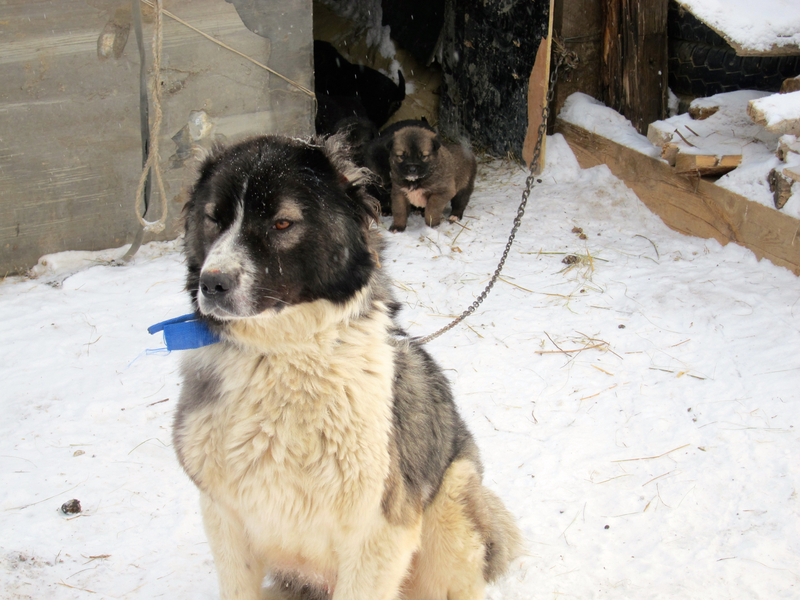 The Bankhar is Mongolia’s indigenous herding dog, related to the Tibetan Mastiff (blog post on the Bankhar coming soon). His girlfriend, who was far less intimidating and friendlier, came out of the kennel to say “hi”, with her puppies following close behind. Daariimaa and her husband welcomed us into their home, displaying the legendary Mongolian hospitality. Their house was very modest, but comfortably warm. We shared a pot of airag whilst completing the official business of our visit. Airag is a traditional Mongolian alcoholic drink made by fermenting horse milk. As exotic as airag may sound, the taste was surprisingly mild and pleasant, almost indistinguishable from unsweetened yoghurt. Daariimaa explained that the renovations had gone well, improving the warmth of the home compared to previous winters. 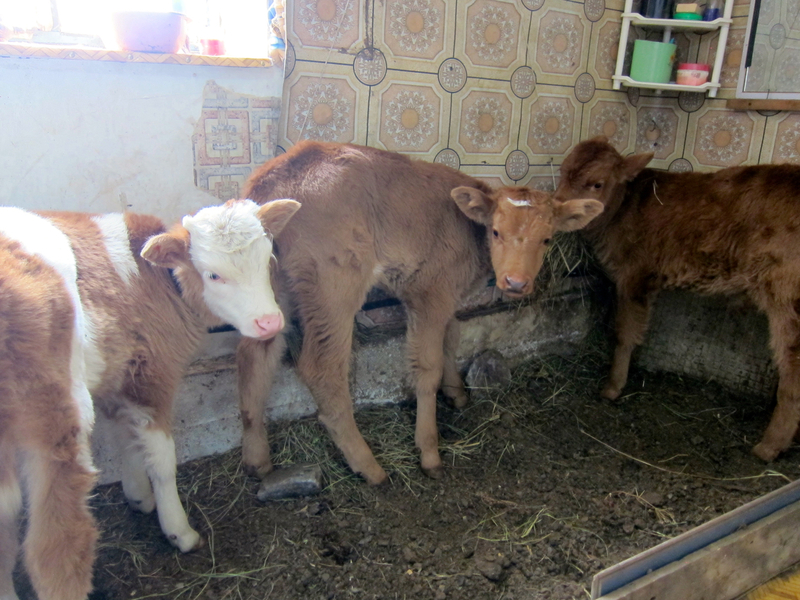 The most striking feature of their home was not the building itself, but the three newborn calves sitting in a dirt-floor area in the corner of the main living space. Daariimaa explained that these calves had all been born within the past three weeks. They kept them inside during the day whilst their mothers grazed with the rest of the herd in the fields beyond the town, because the cold is too intense for the calves at that age. Whilst the babies stay behind, Daariimaa’s husband guides the herd—approximately 30 each of horse and cattle—to pastures out of town each morning and brings them back home each evening. It has been both eye-opening and uplifting to visit families like Daariimaa’s, who Kiva and Credit Mongol have helped though microfinance. Although the lives of many of these families remaining quite hard, the availability of microfinance has opened doorways for them to improve their lives in ways that would otherwise be impossible. Some have been able to send their spouse or children to university. Others have been able to finance the expansion of their businesses. But in each circumstance, the expansion of opportunity has helped the family lift themselves further out of poverty and provide for a more prosperous future for their children and grandchildren. 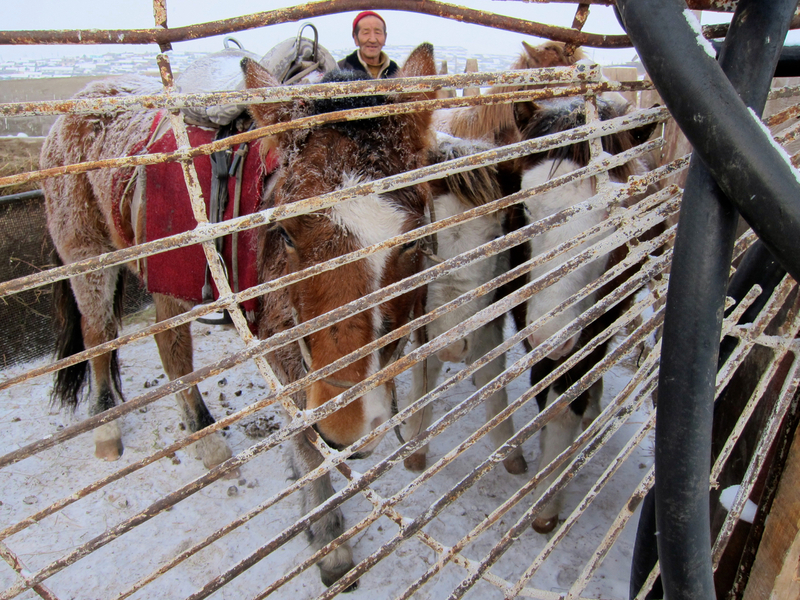 Horses huddle together to keep warm in Darkhan. I really think you should try to submit this to Project for Awesome at the end of this year… I think it would be really successful. It’s really cool to see their way of life up there. In just a few posts, you’re really changed my perception of what it is like there. It’s much richer, and unique, than I gave it credit for. Also, that dog does look a bit intimidating. I love Project for Awesome, but how would I submit this for it? Isn’t Project for Awesome a YouTube video charity project?